I know the stress that comes when you have guests over but no spare bed. Or when you want to go on a camping trip but are anxious about sleeping on an uncomfortable place. I know of the stress that comes with going to sleep in a hotel with your family but not wanting to pay for an extra room. How do I know all this? Well, I have been in these stressful situations before and I learned the need for a good quality mattress. My intense love for sleep is ideally what led me to the Intex Deluxe Pillow Rest Raised Comfort Queen airbed. This air bed is praised by many campers, renters and homeowners for its quality night sleep. The Intex Deluxe airbed is not just ideal for campers and guests. It also comes in handy for people who have to move often but hate moving a box and a mattress each time. College students will also find the mattress a great asset. The Inter Deluxe airbed comes with a storage duffle bag. Read on for an unbiased review of this blow-up mattress. This airbed measures 19 by 82 by 64 inches. This the size of a queen size bed. You can comfortably fit your queen sized bed sheets on it. The best also stands slightly higher than regular inflatable mattresses. But thats not a deal breaker as you can easily climb and get off it. With a capacity of 300 pounds, this inflatable bed can easily hold the weight of two full grown adults. The bed features15-gauge vinyl beams on the sides and bottoms. These keep the mattress stable so that even extremely active sleepers can have a comfortable sleep. The bed also features a 21.2-gauge waterproof flocked top that has been tested and approved. The Intex airbed comes with a built-in electric pump that makes inflation and deflation something that can be done practically in minutes. You will have no stress of using a foot pump to manually put up this bed. The mattress features an adjustable button on the side that allows you to inflate or deflate the bed as you wish. Customers whove bought the bed have praised it for its comfort. Customers who have gone camping with this mattress have written excellent reviews about their experiences. Most of them feel it is easy to maintain the mattress. Some customers even say they wash their mattresses when they get mud. Most campers love the fact that that the mattress is easy to store. Majority of customers have commended this inflatable mattress. According to most people, its value is worth more than price. Besides this, the bed is more affordable at only $$, compared to most others in the market. One customer complained of getting a stiff neck from the raised pillow. But this is a unique complain with no other customer having such issues. According to some reviews, this mattress tends to have undetectable leakage issues. The customers who experienced this problem complained about air coming out of the bed within a few hours or weeks of use. They were however unable to easily locate the source of leak. There are customers who find it cumbersome to maintain the bed on the days they have to use it repeatedly for several nights. According to these reviewers, this inflatable bed will deflate within a few hours of use and you need to frequently pump air into it, which is bothersome. According to some reviewers, the seams in the middle sometimes get undone and cause a bulge in the middle of the mattress. This can make the mattress extremely uncomfortable to sleep on. According to the reviews that we analyzed, more users found that the Intex Deluxe Pillow Rest Raised Comfort Queen airbed handy especially when used at home for guests. Most reviewers praised this bed for its ease to inflate and for the extreme comfort that it offers. This airbed can hold two adults at the same time, which is convenient for most people. However there were a few complaints of its ability to stay inflated, with some reviewers complaining of the trouble of having to inflate it after every few hours. This bed comes with a 90-day warranty. However, according to most people, this is not very useful since this is not a bed one will use continuously or frequently within those 90 days. This means the warranty may become void before you claim it. Most people that had leakage issues are the ones that complained about the unsuitability of the warranty. Most customers who bought this bed used it as a temporary sleeping solution, for guests and for camping trips. This means they only used it for a few days and then stored it away in the duffel bag, the other days. Overall, customers love this bed but they feel that the quality could have been better for a more enhanced sleeping experience. 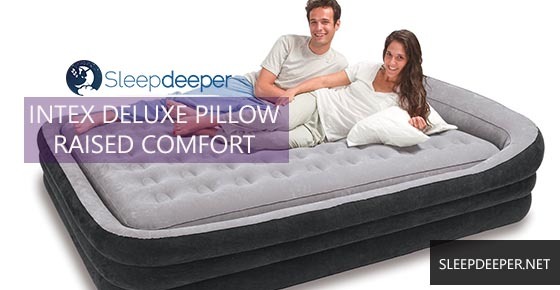 At SleepDeeper, we feel this is not the best inflatable mattress in the market. If you are looking for a high-end option, Homes Direct 365 has many options to choose from. Check out other Intex air bed reviews here for better alternatives.